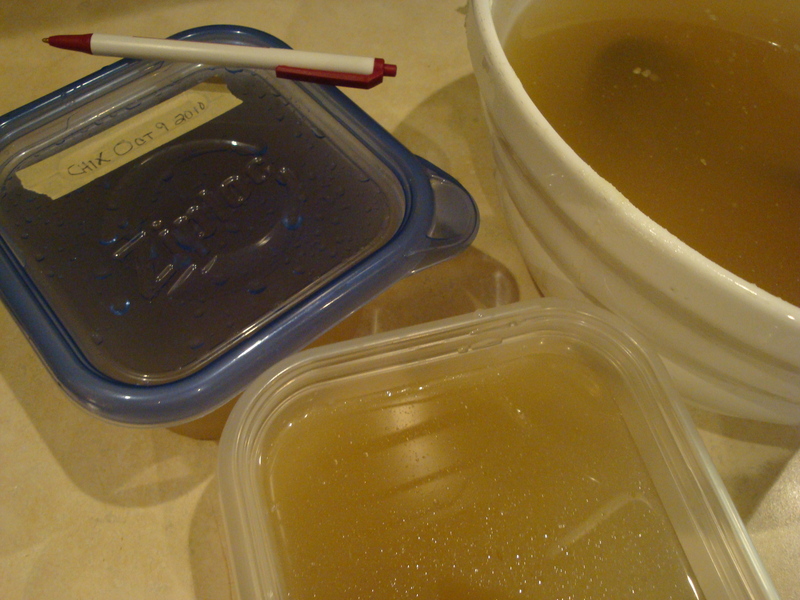 I like to have lots of chicken stock on hand in my freezer so that when recipes call for it, I don’t have to use store-bought. 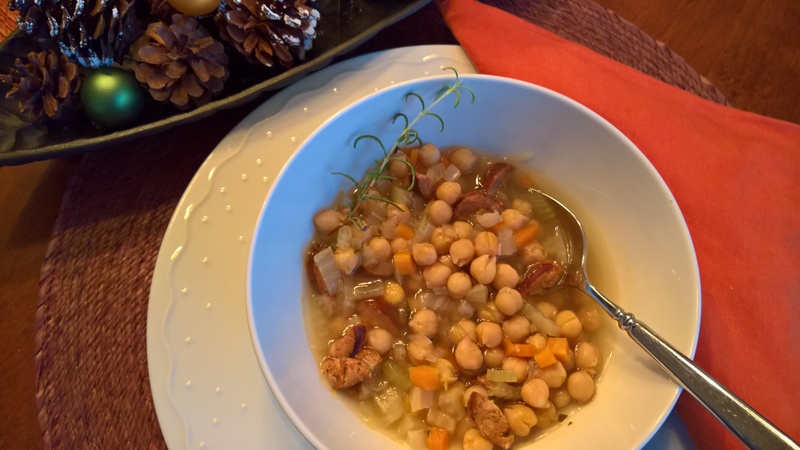 Not that I have never used store-bought stock or broth, but I don’t like the taste or the texture of boxed or canned chicken stock when compared to homemade. And it’s so easy to make! You can use fresh chicken as the basis – backs/necks, pieces like wings/legs or a whole chicken if you want lots of meat to use in a soup or to make chicken salad, etc. Bones are important for flavoring the stock, so using boneless/skinless chicken doesn’t work so well. Or you can start with a leftover roasted chicken carcass. I prefer the fresh for its lighter and cleaner taste, but I always make stock when I’ve roasted a chicken, making sure my freezer doesn’t run out! 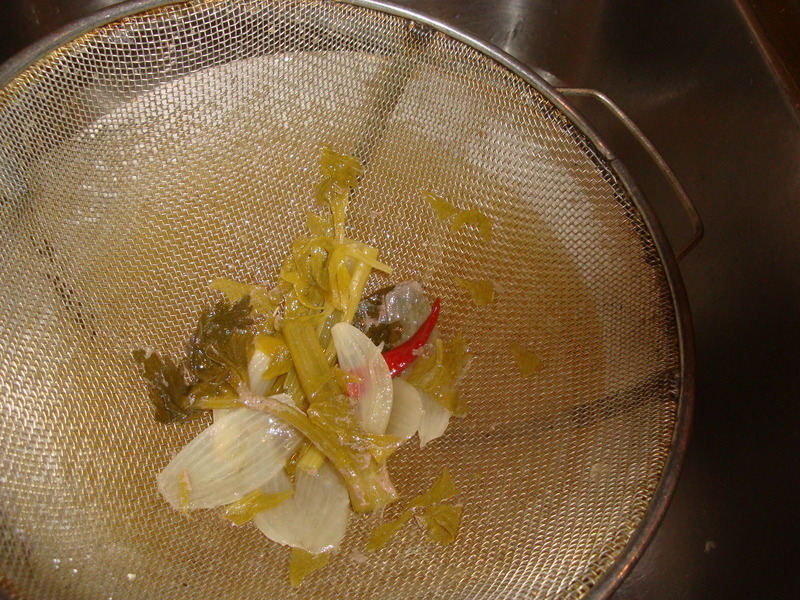 This is best done as a 2-day process so that you can de-fat the broth. I’m totally like Suzy, and always like to have broth in my freezer. I can’t believe that I used to not care! There’s such a difference in flavor and texture. I make recipes that call for whole chickens cut up at least twice a month, and always buy a whole chicken and cut it up myself so that I have the back, neck and wings to make broth out of. I use a big All-Clad pot that has a big pasta basket in it, so that when the broth is done I can just lift the basket out with the vegetables and chicken. Then I cool the stock in the pot overnight, skim it in the morning, and then I pour it through a sieve into containers…taking the big stuff out first eliminates splashes! Place the chicken base of your choice as described above in a large dutch oven or soup pot. Add water to about 3 inches below the rim. To this, add the tops off of one bunch of celery, two unpeeled carrots cut in 2-3 pieces and one unpeeled onion cut into 4 chunks. Add 2 bay leaves, 2 dried chiles (optional), 1 teaspoon kosher salt and a few grinds of pepper. Salt and pepper are also optional if you want to wait to season whatever dishes you make with the stock. Add more water to bring to about 1 inch from the rim of the pot. I am using a 6-quart All Clad stock pot. Pour the liquid into a bowl (or bowls) through a strainer to strain out the vegetables. Let the stock cool in the bowls, then cover with plastic wrap or foil and refrigerate overnight. 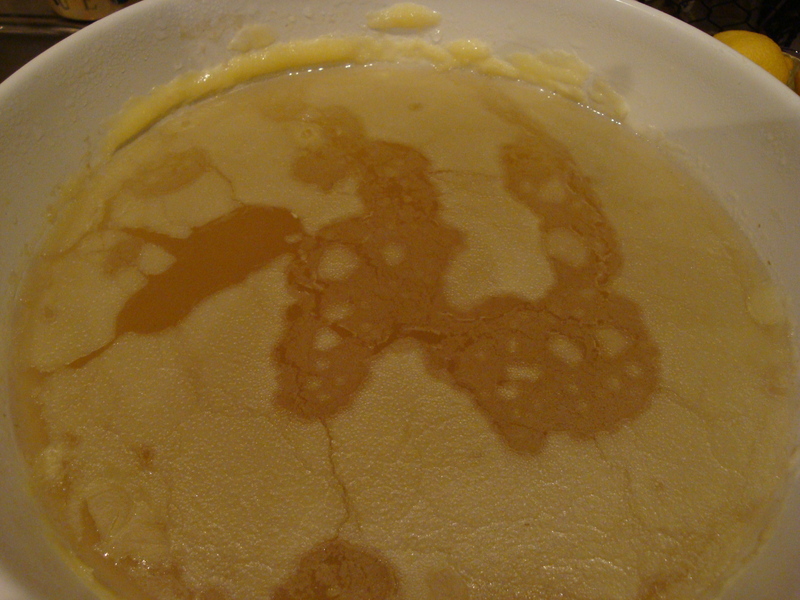 The next day, you will be able to skim off the fat that has risen to the top and somewhat solidified. I use paper towels to do this. Now you have defatted chicken stock that you can use immediately or place in pint or quart containers to freeze for use at a later date. Aunt Suzy says . . . You can add all kinds of aromatics to the pot before cooking – garlic, ginger, cinnamon, cloves, parsley, thyme, etc., etc. I don’t add these things unless I will be using the stock immediately in a recipe where the flavors are compatible. 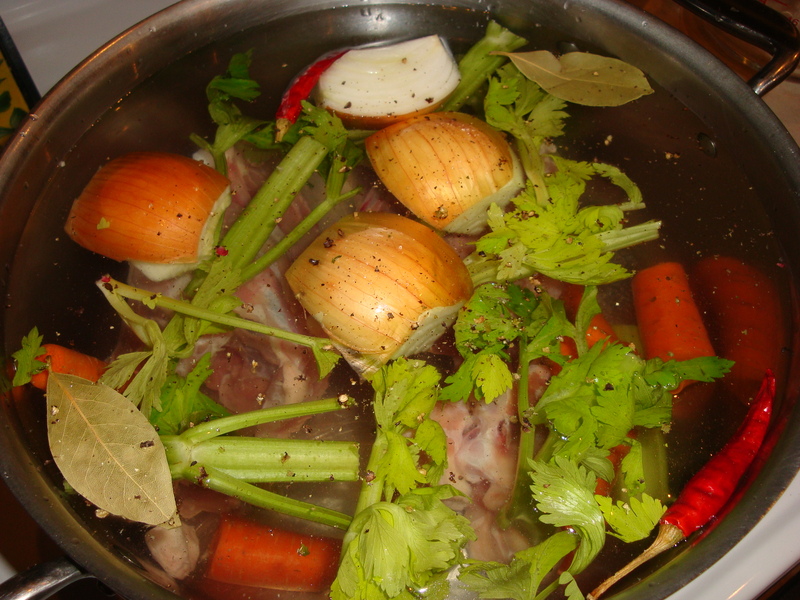 I stick to the celery, carrots, onion, bay leaves and pepper so that the stock has a more neutral taste. This insures it won’t overpower or conflict with the flavors in the recipes where I use the stock. Today, I got 5 quarts from this recipe that didn’t cost more than $5 total for the chicken backs/necks and the vegetables. They sell home-made stock at two places in my nieghborhood for $7-9/quart! 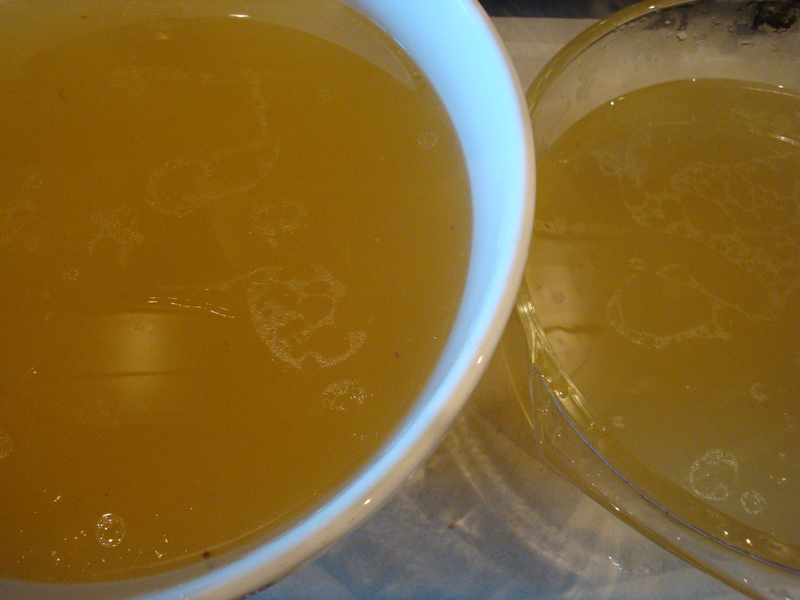 Maybe I should go into the chicken stock biz :-).